This week we were starting to get into the swing of math. I was planning the way I want to be planning. I knew what I was doing for the week by Sunday- and that hadn’t happened yet this year. Our activities were fun, engaging, hands-on, and had bodies moving. I was so excited. And then, we’ve decided to change things up for math. We’re going to mix our kids between our two classes and teach more homogeneous groups. It’ll be so much better instructionally and I’m so excited about it. I just need to rework a few things or two. This week, though, we were working on place value to the thousands place. We’re still teaching our state standards and that’s as far as our standards go. Our textbook basically starts the year going to the millions place. We’re so not ready for that so we were kind of on our own and I was on the hunt for resources. First, I made this pack last year and knew I was going to use it. It goes up to the millions place but it’s built into pieces. So, I can use the pieces now that go to the thousands place and then use the same thing later, since the students are familiar with it, when we’re ready to work on higher numbers. You can check it out on TpT by clicking the images. You can get this center as a freebie by clicking the image above. One area this pack spends a lot of time on, and we’ve spent a lot of time on this week, is mentally adding ten or multiples of ten and one hundred to a number. They’ve gotten pretty good with adding, but still struggle a bit with subtracting- especially if they have to borrow or carry. We’re going to keep practicing a bit. We also needed to practice standard, expanded, and word form. I couldn’t find anything I really wanted so I created a Write the Room set on my own. This set is free in my TpT store. Just click on either of the images. Students write what is on the card in the corresponding box and then they write the other two forms of the number on the recording sheet. I had sets of Write the Rooms up by the end of the week. The students loved walking around the room and working on it. A couple kiddos were even angry when they didn’t get to finish. Thank you for sharing the items above. I really appreciate it. Thank you so much! These are wonderful activities!! Love these activities! Thanks for sharing! 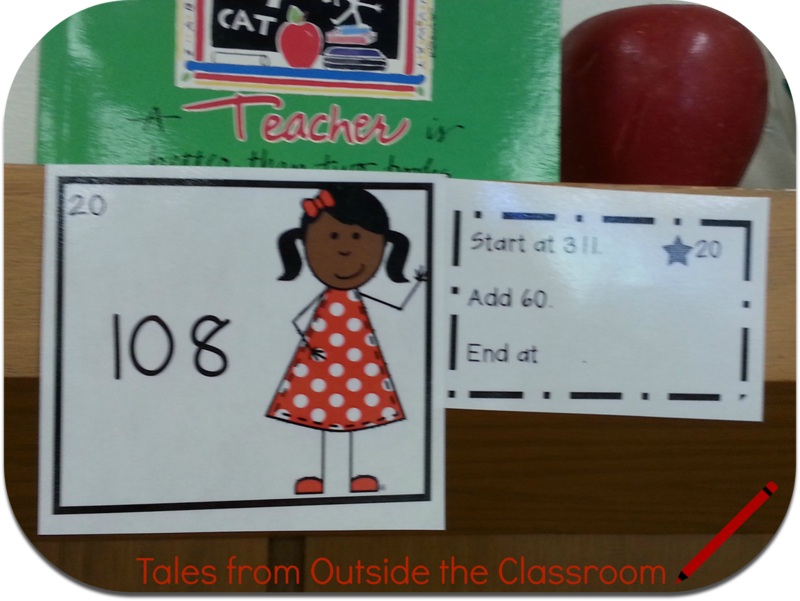 We are finishing up place value right now – your write the room activity will be a great center! Thanks so much! My students love walking the halls to do the write the room activities. I put the cards in our hallway and then our whole second grade team can choose to have their classes work the problems or not…Thanks for sharing!